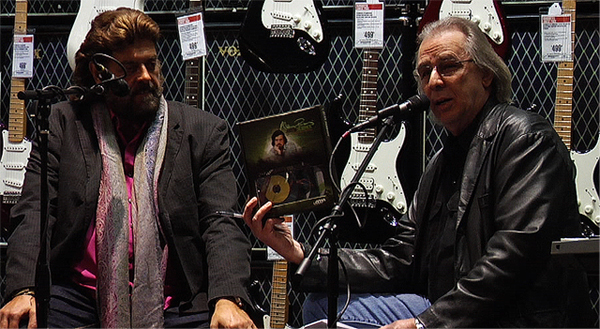 Dateline Dec 10th 2010: As part of the series’ DVD release, Alan Parsons made a series of in-store appearances with his Alan Parsons Live Project band, interleaving live performances of some of his classic tracks such as Eye In The Sky and Games People Play with a live interview and Q&A session with the audience. Coinciding with the AES show in San Francisco, Alan performed at the Guitar Center location on Geary St. and was interviewed by the recently appointed editor of EQ Magazine, Sarah Jones. The event was filmed by Guitar Center and ASSR producers KEYFAX NewMedia; excerpts from which will be posted on artandscienceofsound.com in December. Later in the month Alan and his live band appeared at the Guitar Center in West Hollywood. The Session, filmed using a multi-camera shoot for Guitar Center’s Sessions Series, featured a live interview with famed LA DJ Jim Ladd (the last free form rock DJ in America) from LA’s classic rock station, KLOS. “I've seen a lot of videos in my life... I've never seen anything quite like this... quite as informative and at the same time, easy to watch. Just flat interesting,"said Jim. More appearances and events are currently being planned for 2011. The West Hollywood Sessions video is scheduled to go live on the Guitar Center website / Direct TV in Feb 2011.